Designed as a tribute to Bulova’s acclaimed 1970’s Oceanographer diver, the Devil Diver is named after the water resistance rating of 666 feet (200 meters), and is a Limited Edition with only 666 individually numbered pieces available. 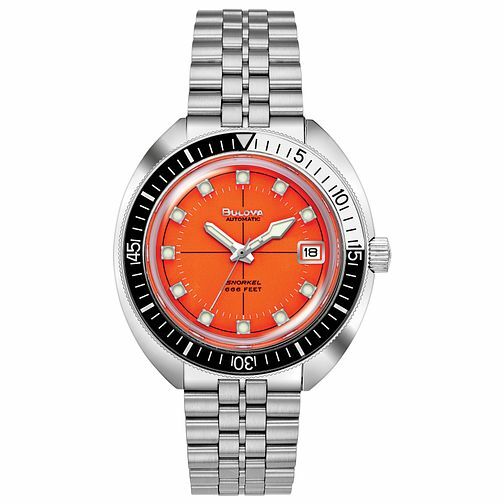 Combining style and function, this watch boasts an orange dial with contrasting white tone hands and markers, powered by a Swiss made automatic movement, and features a date window at the 3-o-clock position. The Devil Diver is finished with a stainless steel bracelet, fitted with a fold-over buckle closure for a simple and secure fit, and presented in a special box with a limited edition insert card. Bulova Devil Diver Archive Ltd Edition Men's Bracelet Watch is rated 5.0 out of 5 by 1.